You are able to export various maps from QuoVadis 7 to QVM, which can be used by your phone offline without an active internet connection. The export requires the installation of the actual version of QuoVadis 7, which is from QV-Version 7.0.1.31. The map engine in QVM is based on the so-called Mercator projection which is also used by e.g. Google, OSM. 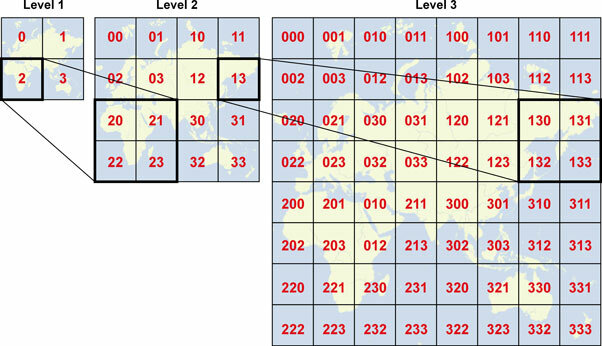 Therefore the raster map is divided into grid-formed tiles of 256×256 pixels. For the map export QuoVadis 7 is forming the selected parts of the map as tiles and saving them as a zip file with the ending *.qmz. Additionally you will find an automatically generated small xml-file in the zip file which contains information about zoom level or expansion. If you select an existing QMZ-file for the export new tiles will be added easily and tiles which are already exist will be replaced. Please notice that the existing file will not be overwritten. The maximum size of the exportable region is also for QVM depending on the licensor of the map and will be shown to you on the status bar of the export dialogue. Furthermore, no special characters and spaces should be in the card name! The export of maps in Mercator projection from QuoVadis 7 directly to QVM is only possible for online maps. The maximum size of the map section is limited for licensed maps. If you like to export another type of map e.g. a topo map, you need to upload it at first as an overlay to another online map. So the map can be re-projected on Mercator. We recommend to hide the online-map by the project manager to avoid that it will be exported, too. In the map export assistant on the start screen select QVM as the destination. On the second screen you need to enter the desired zoom factor, as with any other exports. Maybe you need a little moment to find out the best zoom factor for a good visualization of the map screen on your phone. For a map scale with 1:25.000 you can regular go until 13%. You can transfer the generated QMZ-file to your mobile phone in different ways. Now look at your list and select Import from the menue bar. The QMZ-map will be copied to the internal memory and entered in the map table. The QMZ is no longer needed after this. Important note: By the similar way you can also send databases (*.SDF) and GPX-files to QVM.